Travel: Romania Diary | MADRAS INK. The first thing you need to know about travelling to Transilvania, as the large historical central belt of Romania is popularly called, is that the visa process is a long painful wait because it does not fall under the Schengen region yet. Getting a visa to Romania is a suspenseful mystery process because it may take anywhere between three days to thirty days and no one at the Romanian Embassy in Delhi is ever in the mood to answer phones or answer emails. The much-awaited visa arrived the day AFTER the scheduled flight date of the tickets submitted with the application, almost 25 days after we applied. And all we got was a stingy single entry 7-day visa. I was visiting Cluj-Napoca to attend the Transilvania International Film Festival with multiple venues all over town. 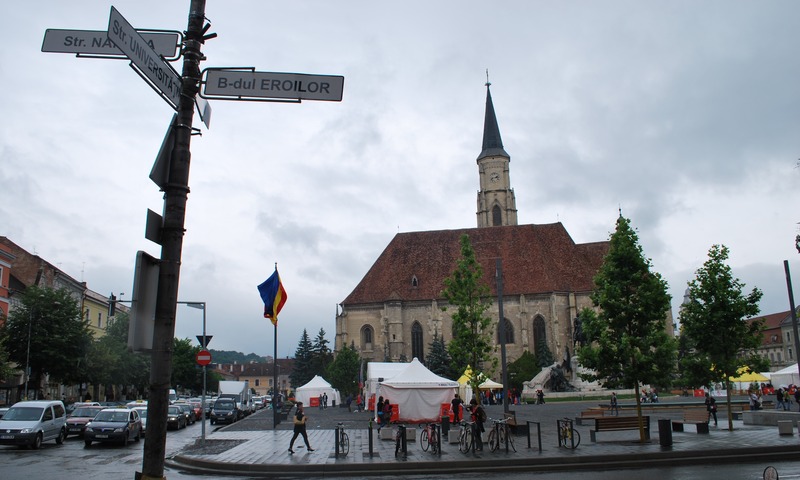 Around 55,000 people visit the film festival in Cluj, annually and this period in the first week of June may be the best time to visit the town if you want to meet a truly cosmopolitan bunch of travellers. Since Cluj is a University town bustling with young people who understand and speak English, getting around is not much of a problem. The town has a population of about 3.75 lakh people and a majority of them are students. If you are vegetarian, be warned that the options for food are really limited. Four-star hotels in Cluj compare well with two star hotels in Indian metros and charge a bomb (anywhere between 75 to 80 Euros a night), so you are better off staying in service apartments. Thanks to a Moldovian filmmaker friend, Vitalie, who had stayed there for ten days during the fest, we found a fully furnished service apartment with two rooms for 12 Euros a night a little away from the town centre (Str. Migdaliliu 22a, to be precise). Taxi is the local mode of transport and the drivers charge you by the meter (1.8 lei per kilometer… 4.1 lei makes a Euro). At the centre of town is the Unirii Square, where St. Michael’s church, the tallest tower in Romania is located. You will always find tourists posing in front of the statue of Matthias Cornivus, former king of Hungary, who was born in Cluj. Diagonally opposite is the picturesque New York Palace and the architecture of buildings in the area is strikingly old world. 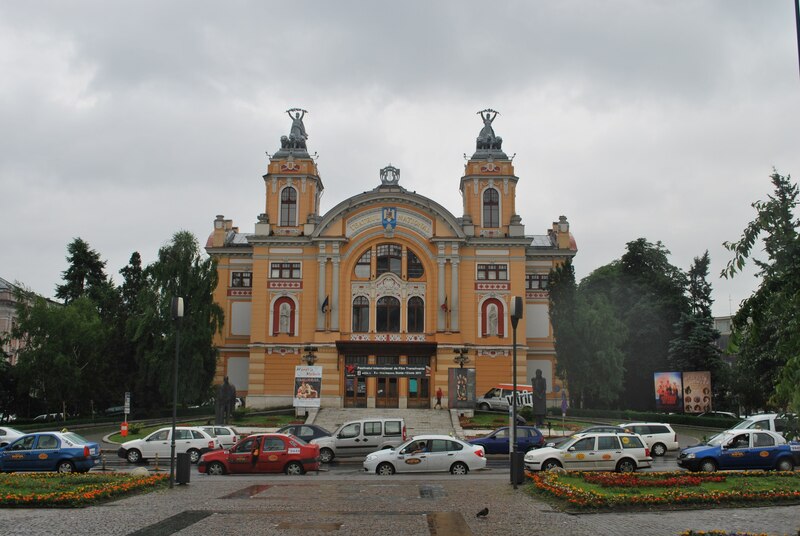 On the other side of the Unirii Square is the symmetrical Iuliu Maniu street and if you walk one block, you will reach the Avram Iancu square that houses the other church, the Orthodox Cathedral on one side and the majestic National Theatre on the other. Right in the centre of the square is a tall statue of Avram Iancu, Romanian lawyer and revolutionary, where he seems to be saying “No Photographs” with his palm raised towards you. There’s also The Central Park, the Botanical Garden and a host of Museums to do touristy stuff. Shopping is restricted to limited business hours on weekdays unless you want to head to the malls – the Iulius Mall and the Polus Centre at the other end of town. But the real charm of the town lies in its clubs and love for art and architecture. Boiler Club, for example, used to be the boiler room of a factory now shut down and hosts underground acts. Gandu Circus from India performed during the festival in the basement there. The other floors of the building have been converted as spaces for art exhibitions. The cafes and the bistros are equally lovely. Sample Marty’s Café if you like a Terrace Garden sort of a set-up or the Corso Café and Bistro on Unirii Square if you are dying for vegetarian food (they just have Penne with Pesto sauce but that’s great in a town with very little vegetarian food) the street-side Klausenburg Café for your regular fix of caffeine because if there’s one thing you need in this town, it’s to stay awake. The sun sets only around ten p.m and rises by six a.m. It’s God’s way of telling you to walk around and explore. Most people who visit Romania don’t come back without visiting Bucharest, the capital. 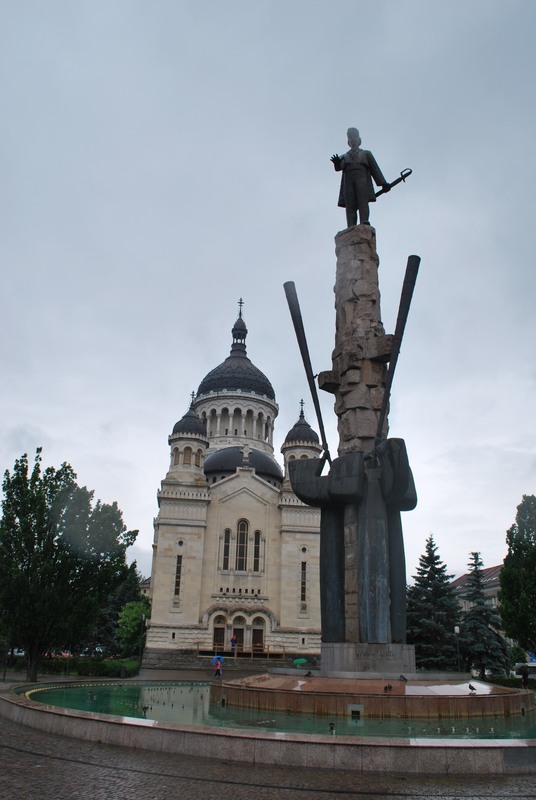 But since our first stop was Cluj-Napoca and we were warned by the locals there about the big bad nature of their capital city famous for its notorious tourist traps, we decided to head to a quieter little city called Sibiu instead, about 160 kilometres – a two-hour drive – away. Forbes magazine had once rated Sibiu “Europe’s 8th most idyllic places to live” and the fact that the city was surrounded by mountains, instantly, gave us an inviting vibe. 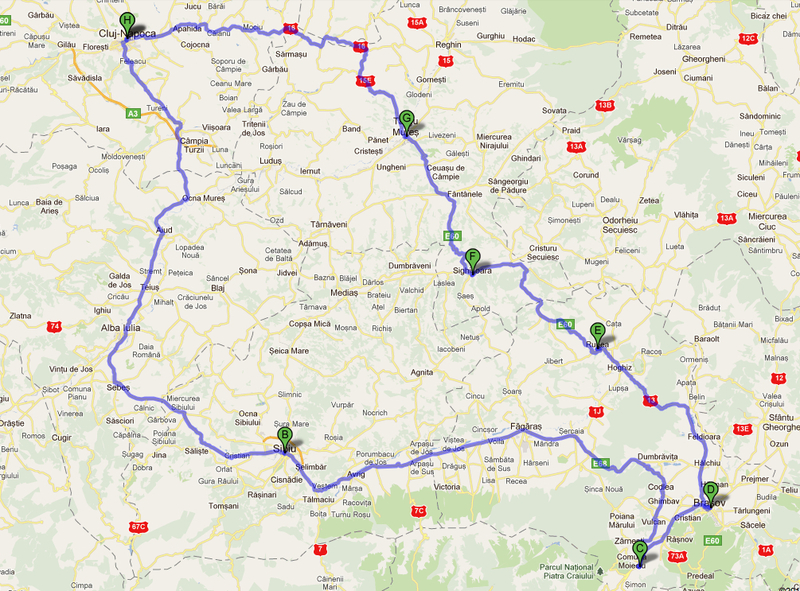 So, without even bothering to make hotel bookings, we rented a car and set out to Sibiu. Trust Lonely Planet to scout out the best places to stay. There’s something for every budget starting from 2 Euros a night for a bed to crash in to four-star luxury for about 200 Euros. After dumping our bags at Vila Andra, a reasonably priced three-star villa that charged us about 80 Euros per room, we set out to see the town. In winter, you could head 35 kilometers south-west to Paltinis, the mountain resort in the Cindrel Mountains, a popular skiing destination. But during summer, there’s just the town and the museums to see. The best place to start exploring any European town is from the town centre that usually has a Square. 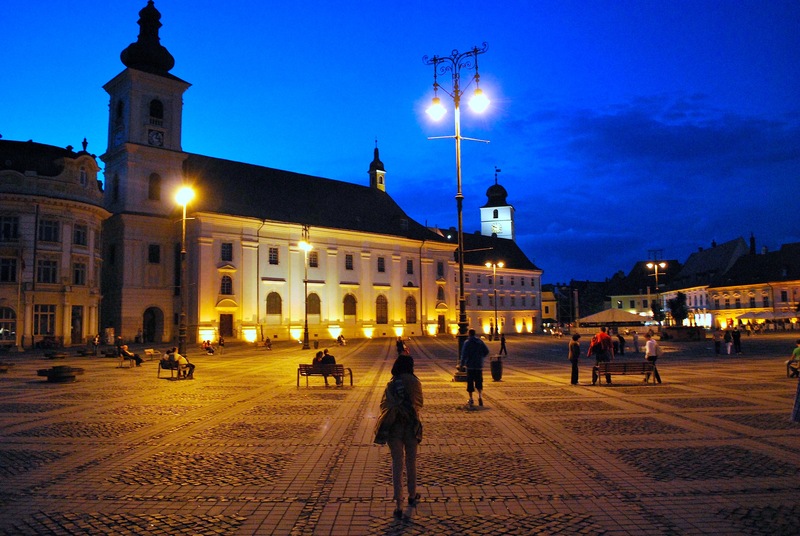 Sibiu has three of them, with a car park at the Town Centre for tourists to leave their wheels behind and stroll around leisurely to soak in the romance of Sibiu. From the centre, you can see the picturesque rooftops of the houses in the Lower Town. The three squares are a part of the Upper Town. As you make your way from the Piata Unirii (Town Centre) you find a row of beer bars dotting the cobblestone walkway with shops and markets on either side. Since only walking and cycling is allowed, it’s the perfect stretch to slower your pace and look around for souvenirs and curios. A ten-minute walk later, we are at Piata Mare (Grand Square) that houses the Brukenthal Palace and all around are similar Baroque styled buildings. The evening lighting just makes it all the more romantic with park benches scattered throughout and the remains of a medieval fountain at the heart of the square protected by a cage. The Square is Grand indeed with the majestic structures decking up the landscape that no matter where you keep your camera, you are sure to get a picture perfect frame. As you walk further, you enter the Piata Mica (Small Square) that is packed with restaurants, bars and pizzerias. It’s almost like the whole town got together for a party. Grab a chair, order a drink and a meal, unwind and you will see the Liars Bridge at one end of the square that connects it to the Lower town. Before you know it, the sun has set and slowly the shops around too shut down. The third square in the area is the gothic Huet Square that’s home to the Evangelical Lutheran Cathedral. The next morning, we set out to the ASTRA open-air ethnography museum that stretches to 96 hectares of land by the Sibiu forest. It’s like time travel as you enter the Traditional Folk Civilization museum. The means of transport around is horse carriage. There are wind-mills at the other end of the lake and visitors fishing at one end. An amphitheatre by the lake seems to be the perfect venue for an evening of live music. 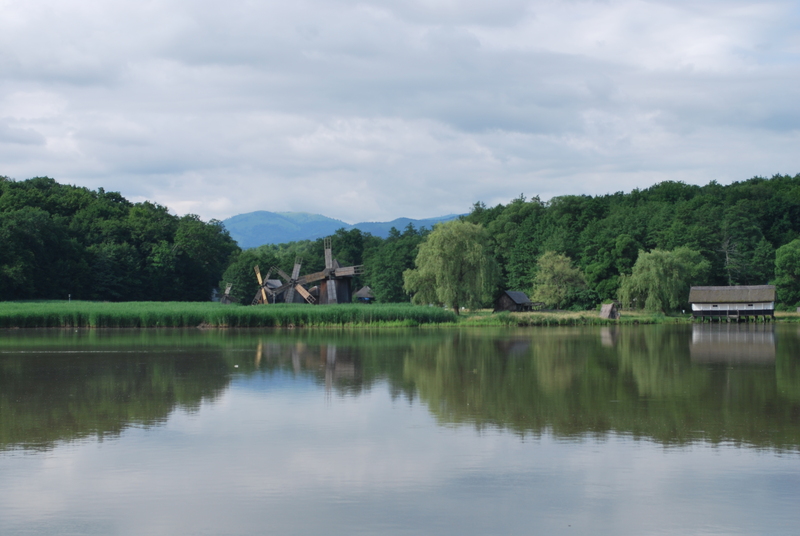 There are statues, structures of Romanian houses, sculptures and water mills as you walk deeper into the park. Or the museum as they call it. If you are a museum lover, there’s a lot to explore in Sibiu – the museum of Transilvanian Civilization, the museum of Saxon Ethnography and Folk Art, the Universal Ethnography museum, the Steam Locomotives Museum near the Railway station apart from the ones in Brukenthal Palace and all around the squares. Since we are not exactly museum geeks, we hit the road again, off to explore yet another side of Transilvania – Castle-spotting. Your trip to Romania is incomplete without going in search of the Dracula’s castle in Transilvania. While there are many castles that claim that they were the inspiration for Bram Stoker’s Dracula, the most popular one among them is the Bran Castle located in Brasov, about 280 kilometres away from Cluj-Napoca, our base in Romania. If you are a stickler for history more than literature, you could go in search of the castle where Vlad Dracul lived, the Prince of Wallachia who was called Dracula for his bloodthirst in the 15th century (he was notorious for impaling his enemies). But then, we find out from Lonely Planet that the ruins of Wallachia are very remote and that there’s not much left there for all your effort. 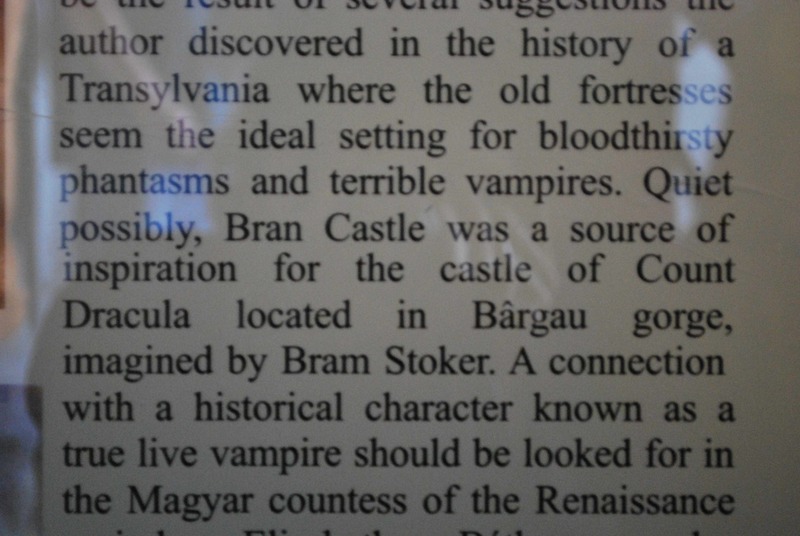 So we decide to the regular touristy thing and decide to hit the road to Bran and also use that as an excuse for a road trip to do castle-spotting around Transilvania. The car rental company at the Cluj airport surprisingly does not seem to mind the Indian driving licence (though they drive on the other side of the road) as long as it’s at least three years old. 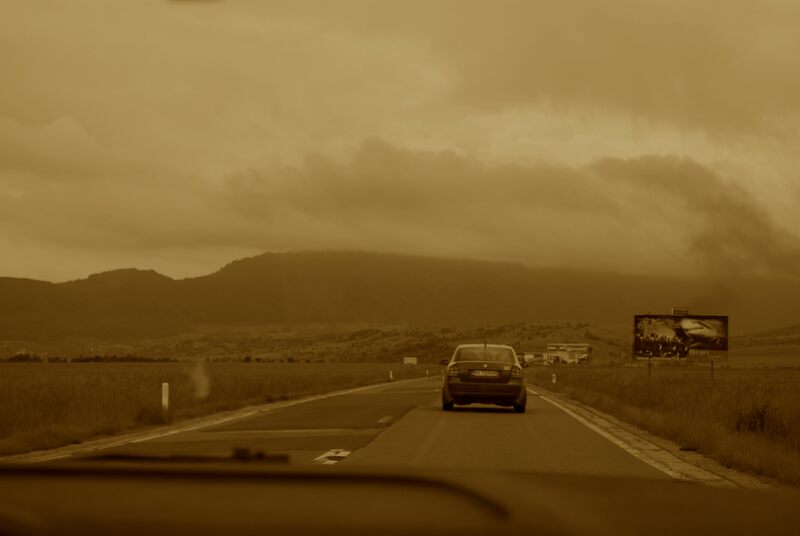 While a car rental will cost you about 50 Euros a day (it’s much cheaper if you book in advance over the internet) and you can also hire a driver for another 30 Euros a day and also pay for his food and overnight accommodation. Remember, fuel is extra and is as expensive as it is in India. So we wisely opt for a diesel car. Within the next three hours, we are in Sibiu. After exploring the small town all evening and some more the next morning (as detailed in Part 2), we set out to Bran. The road to Bran is picturesque, like the Switzerland we see in Bollywood films, long stretch of road to the mountains dotted with sheep and castles passing us by every few minutes. At first, we ask Flavius to slow down to take pictures but give up soon realising that every other building along the road is a castle. As we near Brasov, the countryside gets spooky. It’s straight out of a horror film and we see why Bram Stoker may have been inspired by the eerie landscape for his vampire tale. Imagine trying to click a picture but the camera not responding… Creepy? That’s when I realise the constant movement of the clouds was making it impossible for the camera to take a picture in the auto-focus mode. However, when you get to Bran Castle finally, you see there’s absolutely nothing creepy about it. It’s infested with tourists, largely kids on a field trip. 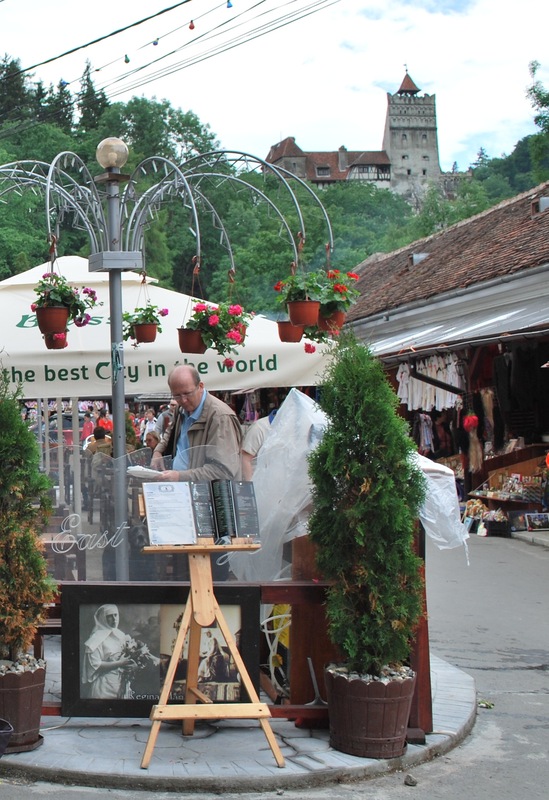 There is bustling marketplace selling Dracula souvenirs and quaint looking cafés with umbrellas that say “Brasso: Probably the best city in the world”. The local industry knows to milk the legend to their advantage and we end up watching a 20 minute 4D movie called “The Haunted Castle” that tried hard to scare at Cinemax 5D. Galeria Bran was a good place to get pizza or pasta located only two-minute away from the castle. After lunch, we walk up to pick up our passes (there’s a 20 lei entry fee, about 5 Euros) to the Castle and you can also opt for an audio guide for commentary. The 13th century castle mostly contains old furniture, sculptures, costumes and artifacts collected by Queen Marie in the 20th century. More than what it stores, it’s known to provide both strategic and scenic views of the city around. It used to be a fortress after all. After a quick stop in Brasov to fuel ourselves with chocolates and cold coffee, we get back on the road as Flavius tells us he’s going to take us back on a different route so that we get to see another countryside of Transilvania. 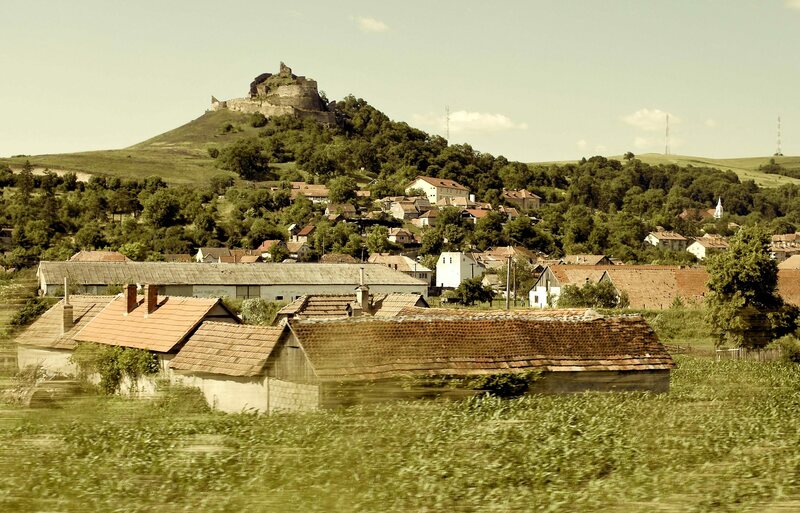 So we drive past the picturesque Rupea fortress surrounded by the Rupea town, all the way to Sighisoara, where Vlad III was born in 1431. With not enough time at hand, we decide against exploring the town and continue driving back to Cluj via Targu Mures, stopping only twice. 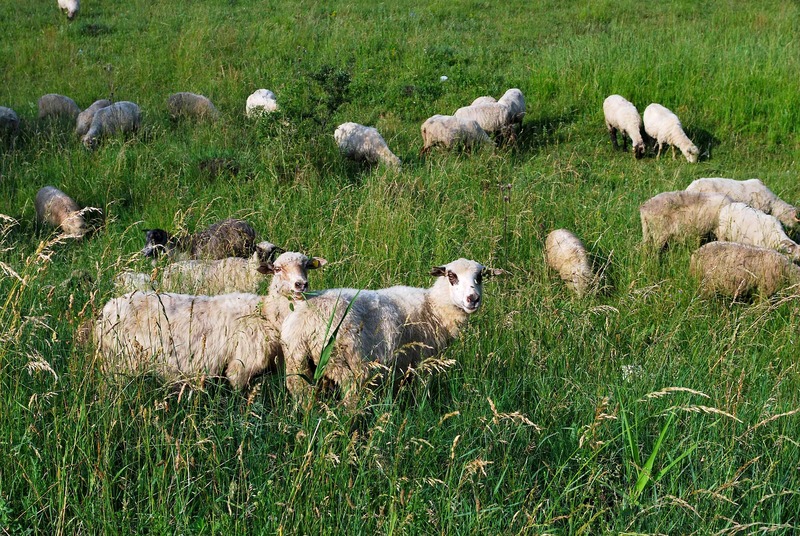 Once to get up close with the sheep for photographs and once to buy wild berries sold by the road by local farmers. They don’t taste all that great but how much fun would a road trip be when you don’t stop to see, smell, feel, listen to and taste as much as you can along the way?